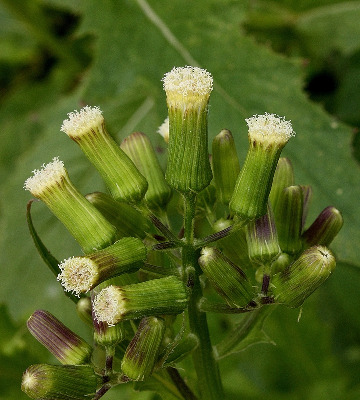 This is one of the relatively few American plants of weedy habit to have become naturalized in parts of Europe. Often in ± moist ground and burned or cleared areas; shores, marshy places, floodplains, disturbed sites, fields. The copious white pappus is as conspicuous as that of Petasites, but comes late in the summer. At the base of the involucre are always some very slender, short, almost hair-like bractlets. Plants vary greatly in size and can be as tall as 2 m or as short as 6 cm when blooming. MICHIGAN FLORA ONLINE. A. A. Reznicek, E. G. Voss, & B. S. Walters. February 2011. University of Michigan. Web. April 24, 2019. https://michiganflora.net/species.aspx?id=313.